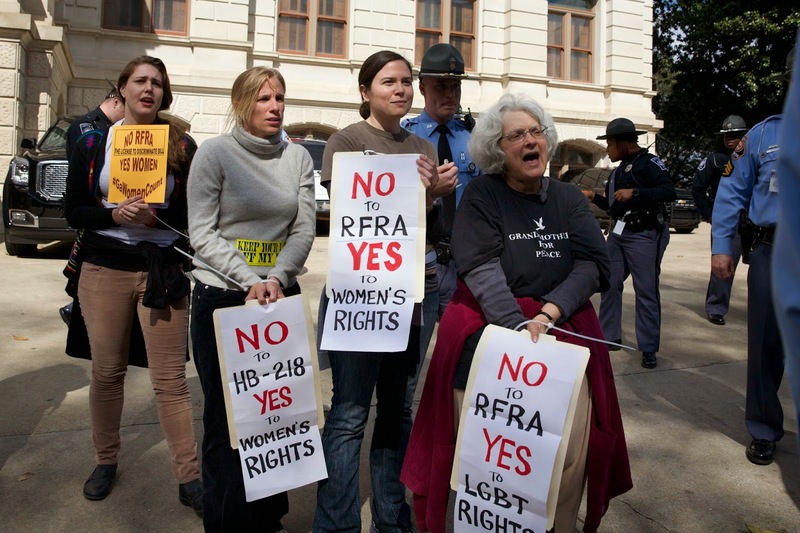 Two Christian Women Refuse Bail Until RFRA is Defeated! It's been five days since a group of women entered Senator Josh McKoon's office to share their concerns with sb129(Religious Freedom Restoration Act). The women were very quickly told that they would be arrested if they didn't leave the office despite the fact that it was during business hours. The women stated, "We will wait until the Senator is able to meet with us." They were quickly arrested. Jess Reznicek and Emma Stitt felt so strongly about the potential harm of RFRA, they have refused to post bond and will remain in jail until the RFRA bill is defeated, or for the duration of their sentence, which has yet to be determined by the courts. 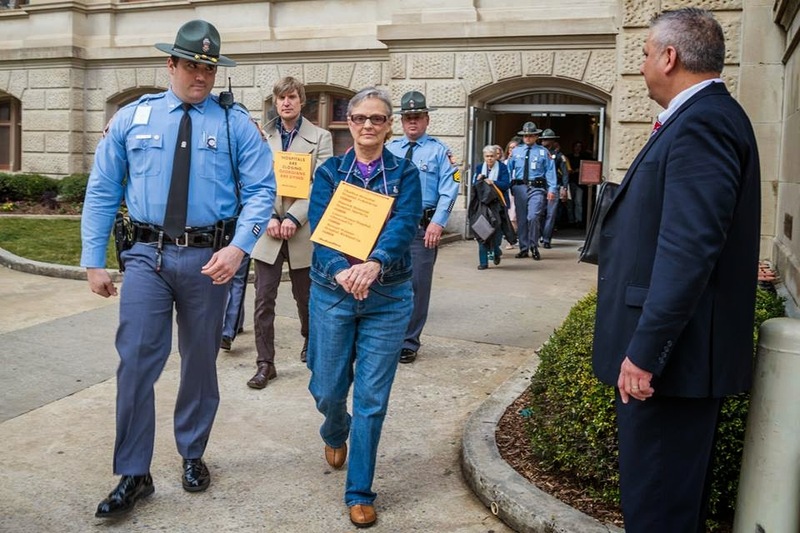 Their refusal to use their privilege to get out of jail is further demonstration of their desire to remain in solidarity with the women of Georgia who are not able to post bond, as well as all of the women of Georgia who will be adversely impacted by RFRA. As Emma and Jess are led by their faith to wait in a jail cell the debate around RFRA continues. Over the course of the last week Senator McKoon has refused to allow an amendment to the bill which would stop it from being used to discriminate against the LGBTQ community and women stating, "That amendment would completely undercut the purpose of the bill." 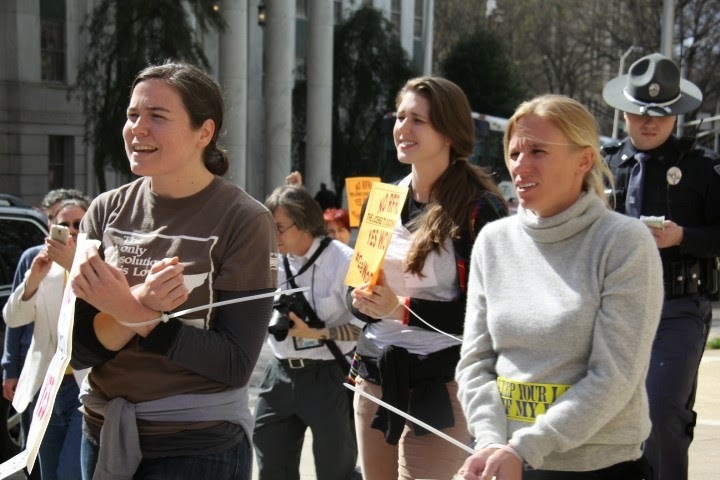 Emma Stitt, 29, has been with the Open Door Community in Atlanta for four years, where she leads weekly soup kitchens and showers for the homeless, ministers to prisoners throughout Georgia, and participates in non-violent street actions to demand justice for the poor, imprisoned and marginalized. Jess Reznicek, 34, is a member of the Des Moines Catholic Worker community in Iowa, which is committed to a simple, nonviolent lifestyle as they work among the poor. Although Jess lives in Iowa, her passion for women’s reproductive rights transcends state lines and has led her to act in solidarity with Georgia women through this action against RFRA. 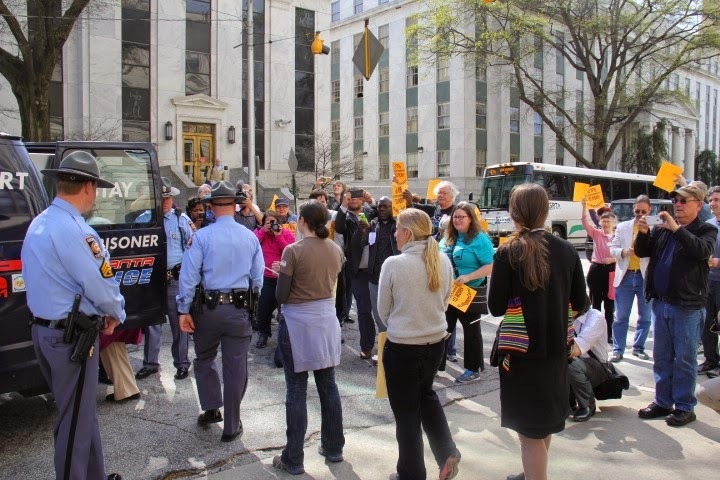 Today a group of women was arrested with Moral Monday Georgia and coalition partner Georgia NOW, attempting to deliver a message to Sen. Joshua Mckoon regarding HB 129. Commonly referred to as the "religious freedom bill" this GA House version of the nationally known RFRA bills has been called a "license to discriminate bill" and is a hot button issue for groups working on LGBT Rights, Ending Violence Against Women, and Reproductive Justice. According to Jackie Rodriguez, President Georgia National Organization for Women, "This bill has far reaching consequences for the health and well being of the women and Georgia. This will not only effect the LGBT community, who is already lacking protection under Georgia law, but it will also be essentially declaring open season on women in this state. We are providing a state sanctioned bill to commit violence against women and roll back what little reproductive rights we have left in this state." 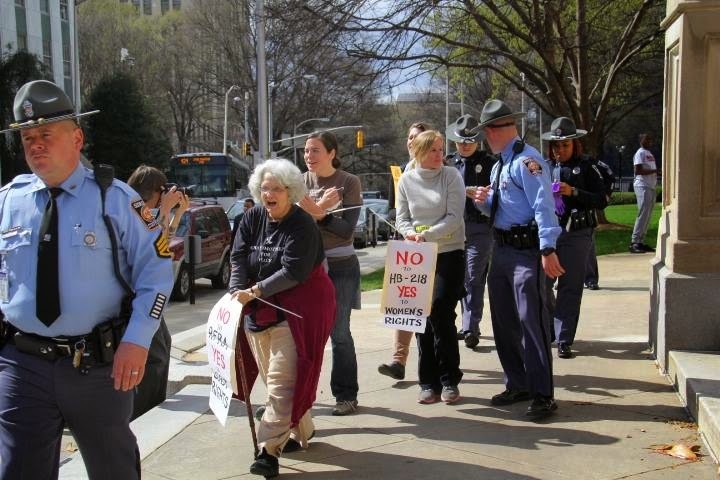 Megan Harrison, Lorraine Fontana, Emma Stitt, and Jessica Reznicek, were arrested attempting to delivery signs to Sen. McKoon that ready "No RFRA Yes WOMEN" and were quickly met by capital police. McKoon refused to meet with the women , having them arrested instead. Refusing to leave until they could pass there messages along to the Senator, they were quickly escorted out by capital police and detained. On the eve of the pending committee vote for HB 129, Emma Stitt and Jessice Reznicek are refusing bond, committing to remaining in custody until the bill has been voted down by the House Judiciary Committee. We encourage those who can to contribute and share the bail/legal fund far and wide! Last year Georgia lawmakers failed to expand Medicaid in our state, falsely claiming that Georgia couldn’t afford it. Over a year later the results have been disastrous. The four rural hospitals listed that Medicaid Expansion would have kept open have been forced to close their doors Charlton Memorial Hospital, Folkston Ga, Hancock Memorial Hospital, Sparta Ga, Lower Oconee Hospital, Glenwood Ga, Stewart Webster Hospital, Richland Ga. According to the Institute of Southern Studies almost 1,200 Georgians needlessly died in 2014 along because Medicaid was not expanded. An estimated 650k regular everyday Georgians, like Athens resident Adam Lassila, could receive life saving preventative care with Medicaid Expansion. Adam, who will attend Monday's rally states, "I recently suffered a serious head injury. I was able to receive high quality health care without incurring thousands of dollars of debt only because I was lucky enough to hurt myself in Argentina, instead of my own state, whose stubborn and inhumane political ploys have thrust me into the horrible gap where the Medicaid expansion should be." 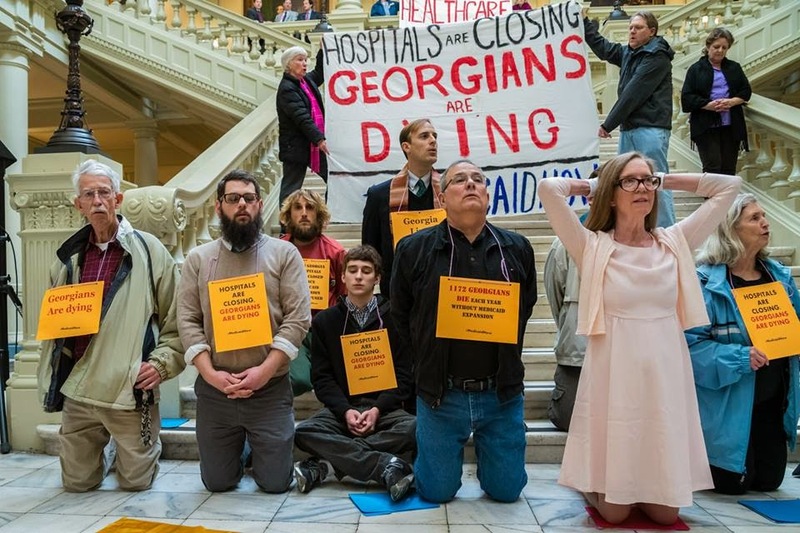 In an effort to curb the extreme forward motion toward a healthcare system that strongly resembles a third world nation, Moral Monday Georgia brought Georgians from around the state together Monday for a day of learning, lobbying, and bold direct action in the tradition of Kingian Nonviolence. After a very spirited press conference inside the Georgia Capitol 12 Georgia residents, all part of the Moral Monday Georgia movement, went to their knees and blocked the south steps of the Capitol with a clear message, “Hospitals are closing, people are dying”. Sometimes we run out of words to say; we have made all the points there are to make; published all the reports about the healthcare crisis in Georgia. With Georgians who are loved and needed dying everyday and live saving hospitals shutting down we simply can’t afford to walk away from the fight to expand medicaid. Now is a time for bold drastic action. Monday’s arrestees ended up spending 17 hours in jail but in doing so forced the issue back into the spotlight in Georgia. We sincerely hope Georgians keep pushing; keep fighting; keep organizing for a state that puts real people before dogmatic politics. 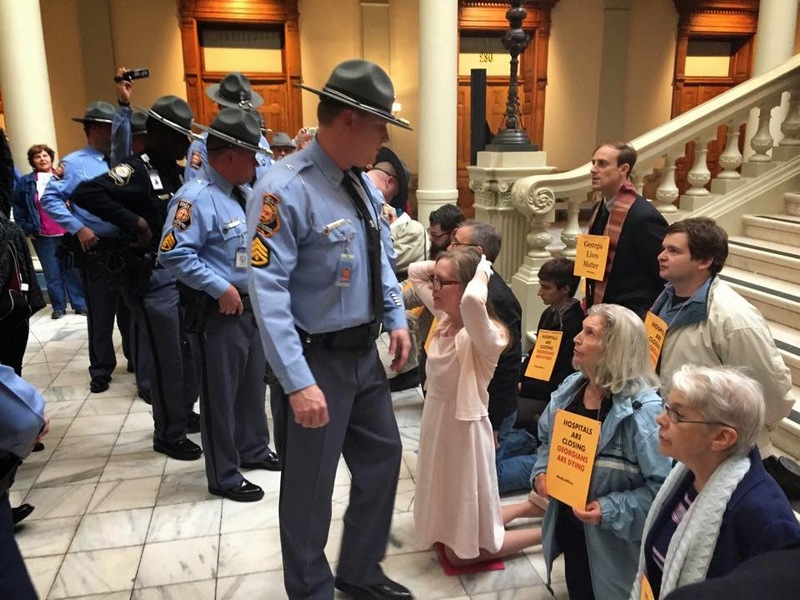 We encourage those that can to contribute to the Georgia Civil Disobedience Fund to support bold actions like this.